Rocky: Adrian! Hey, where's your hat? Adrian: [grabs and hugs Rocky] I love you! Rocky: I love you. I love you. Adrian: I love you. I love you! Tissue, please. Feel the love? 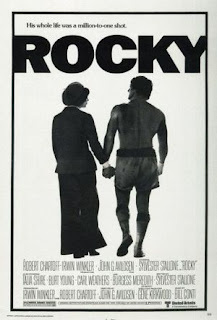 Another favorite line still trapped in my memory was when Salty Dog trainer Mickey commanded Rocky to stay away from Adrian because “Women weaken the legs.” When did that become a bad thing? Rocky: I wanna kiss ya-ya don't have to kiss me back if ya don't feel like it. At that moment in the movie I think, “Kiss me, kiss me!” Sylvester Stallone is so young, so buff and so handsome. And did you know that his dog in the movie, Butkis, was his actual pet? Sly had to quit smoking cigarettes when making the film because he was getting out of breath! Did you know that his screen play was rejected over and over before a small studio picked up it? He directed it, wrote it and starred in it! The film only took 28 days to make.It was voted the Best Movie of 1976, winning three Oscars and putting Sylvester on the Hollywood map. Are you a child of the 70s? Rent it, with or without a sick child. I guarantee you will enjoy the slow moving, heartwarming story of that Philadelphia underdog, The Italian Stallion. Ah, a crusty old friend and an unbeatable spirit. More true love.